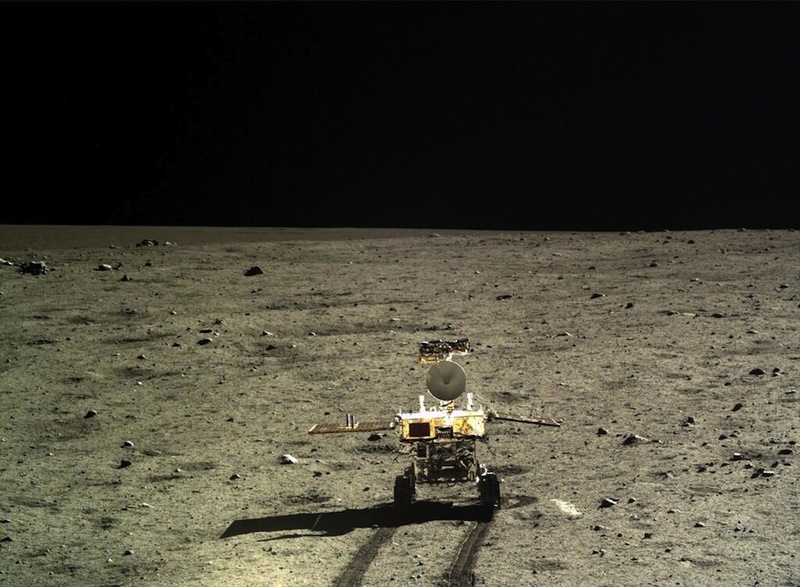 China's moon rover is sleeping through its first lunar night after completing an initial survey of its surroundings, a mostly uniform gray landscape interrupted by scattered boulders and craters. Since landing on the moon Dec. 14, the rover has driven off its landing platform, activated on-board scientific instrumentation, flexed its robotic arm and driven around the lander as the two spacecraft inspected each other with still and video cameras. The Chang'e 3 mission achieved China's first soft landing on another celestial body and made the Asian power the third nation to land a spacecraft on the moon. Chinese state media reported the rover went into hibernation at 2123 GMT (4:23 p.m. EST) Wednesday. Plutonium-powered heaters will keep the rover's sensitive electronics warm during the two-week lunar night, during which temperatures will dip as low as minus 180 degrees Celsius, or minus 292 degrees Fahrenheit. The four-legged stationary lander also entered sleep mode Wednesday to conserve power, the official Xinhua news agency reported. Mission officials told state-run news outlets the two spacecraft would be reactivated around Jan. 12 to continue operations during the moon's two-week daytime period. The rover stands nearly 4 feet tall and has a mass of about 140 kilograms, or 308 pounds. China named the rover Yutu after soliciting suggestions from the public. 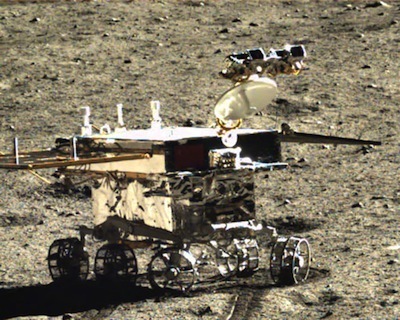 Yutu translates as "Jade Rabbit" in English. In Chinese mythology, Yutu is a rabbit who accompanies the goddess Chang'e to the moon. The six-wheeled Yutu rover drove off the lander on a ramp a few hours after it touched down on the moon, beginning a methodical semicircle drive around the landing platform as cameras snapped images of each craft, including a brief video clip broadcast on Chinese state television. 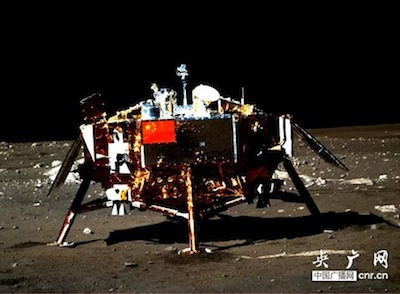 "Ten pictures have been taken at five spots so far, and all of them are better than we expected," said Wu Weiren, chief designer of the China lunar probe program, in a story published on the website of China Central Television. "The rover has moved in a semicircle around the lander. Afterwards, they will begin to conduct scientific explorations of the geography and geomorphology of the landing spot and nearby areas, and materials like minerals and elements there. We will also explore areas 30 meters and 100 meters beneath the lunar soil [using ground-penetrating radar]." 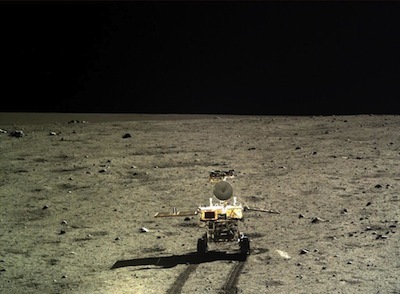 After surveying the lander, the Yutu rover headed south and parked about 40 meters, or 131 feet, away before going into hibernation this week. The rover could operate longer than its planned three-month mission, officials said. "The exploration will continue longer than we planned, because all the instruments and equipments are working very well," Wu said in a story posted on CCTV's website. The rover carries panoramic cameras, a ground-penetrating radar to probe the moon's subsurface structure, and X-ray and near-infrared spectrometers to measure the composition of lunar rocks and soil. The scientific payload has been activated and is reported to be working well. Engineers unlimbered Yutu's robotic arm Monday and checked its ability to move its elbow and wrist joints. The arm will be used to examine rocks up close later in the mission. The Chang'e 3 lander, designed for a one-year mission, carries cameras and an ultraviolet telescope to observe Earth's plasmasphere and conduct the first long-term astronomical observations from the lunar surface, according to China. The rover took a four-day break from Dec. 16 to Dec. 20 as a precaution against high temperatures when the sun was highest in the sky after landing in the middle of the lunar day. Ground controllers at the mission's Beijing operations center switched the rover's systems back on earlier than planned, and officials say future midday interruptions may not be necessary. The Chang'e 3 mission landed in Mare Imbrium, one of the dark regions of the moon carved out by a massive meteorite 3.9 billion years ago and filled with solidified lava. NASA is banned from bilateral cooperation with China's space program under legislation passed in 2011.